The alternative history, paranormal romantic adventure of a young fat woman with low self esteem who falls into another world where fat people lead happy, normal, guilt-free lives. "Fatropolis delves into a fantasy where fat people have no need for 'Fat Acceptance' because they are already accepted as they are. Thompson weaves a fun, thoughtful tale that puts our own struggle for acceptance into stark relief. It's great escapism for those who may feel overwhelmed by the judgements and insults we must endure on a daily basis and I highly recommend it." 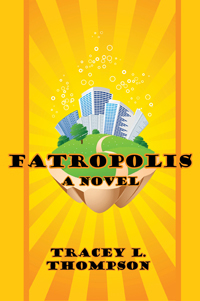 "I'd like to live in Tracey Thompson’s Fatropolis. The food is delightful, potential boyfriends and girlfriends are properly appreciative of the abundant figure, and all the accommodations are scaled to fit large bodies! "Thompson's heroine Jenny accidentally finds this alternate Manhattan where the population hasn’t swallowed the poison pill of fat hatred. Jenny begins the book in a miserable condition. Friends, relatives and total strangers feel justified in ridiculing and judging her because of her plus-sized body. She accepts the verdict that she is lonely and a failure because she cannot succeed in losing weight and nothing else she might accomplish matters. I really felt for Jenny, who is a good, kind person trapped in a painful situation. "When Jenny literally stumbles through a hidden portal into alternate world where her body size is valued, her first reaction is that someone is playing a cruel joke on her. Gradually she recovers from disbelieving shock and begins to realize that the men who pursue her in Fatropolis really do find her irresistible and the women envy her 'hearty' figure. She discovers that food is a pleasure rather than the enemy and that she deserves to live in a world set up to fit rather than to squeeze out her generous proportions. "Jenny's journey takes us on a path many of us have traveled to accept our bodies and enjoy our lives just as we are. It would be easier if we could find one of those portals into Fatropolis, so let me know if you do and let's go!" "Welcome to Fatropolis, where to be 'hearty' is to be desirable and sought after—where foodmakers are valued and warmongers are nonexistent. Welcome to Fatropolis, where to eat and drink is fraught with fun, not with sin. "In a few places in Manhattan, with the help of miniature carved stone goddesses, one can pass through the portals between a world that values thinness and Fathattan, in Fatropolis, a world that values roundness. "All her life Jenny has been told that she is not good enough, not attractive enough, because she is fat. While shopping for a gown for the key social event of the company for which she works, Jenny stumbles through a portal into a different country and a different dimension. Suddenly her round beauty is appreciated, she is fawned and fought over by men, and women are happy to befriend her. "Through her journeys to Fatropolis Jenny learns to value her body and herself and to stand up for what she believes and intuitively honors. But most of all, as Fatropolis gives her a second lease on life, Jenny learns what it is to love herself, to love life, and to love."